This year, it is just the 100th year since Japanese began emigration to Brazil. I celebrate it and made the works. These works are for all Japanese Brazilian, and persons who want to celebrate it. One flower needs 5 parts, and 60 parts are needed for whole. Please begin with process 9 of Anniversary. This is one compass to arrange the tradition work. You will be able to make a lot of arrangement from this instruction. Do you need the diagram (marguerite)? If so, please post the comment to this article.And please write your site(blog) address. It's necessary. When comments are voted more than 200, I promise that I show the diagram on the net for public. 1. One person can vote only once. 2. Please show your site or your blog which can see by everybody. 3. Please show your blog site which has articles more than seven days, if you write the blog URL. 4. If you have neither the site nor the blog, please become a kusudama origami or Origami addict group member. I'll count you if you let me know about it. If there is violation of a rule, I cannot count your comment. This flower is same as the work of Rosy Rose I created before. This time, I created leaf for getting parts together in to the whole with thread (strings). 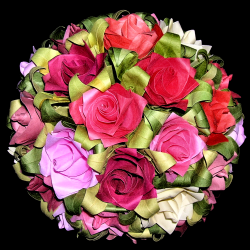 I think the appearances seems to be totally a bouquet and this is really a work like the kusudama. The second photo is the work before adding curls to leaves. You can see these big photos im my Japanese website. I make putting the links in this site(Atelier Puupuu), now. 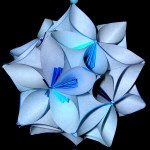 Please let me know your origami blog site if you don't mind. This blog will link to yours. Thank you very very much for your kindness and infos! These were addresses which I borrowed from free rental server before. And now, I rent other server. and are used by other person now. I'm not the site owner any more. And I don't have relations with them at all. It seems that they pretend to be my site cleverly. Thank you for your noticing. The bottom photo is a fusuma unit. It was assembled parts first. And the parts of "Bellflower of Froebel" were added. All the processes of making this work don't need glue. If you have the diagram of "Bellflower of Froebel", you may understand why this work does not have to use the glue. I got a lot of comments of birthday at Facebook. They encouraged me very much. I thank all of my friends. 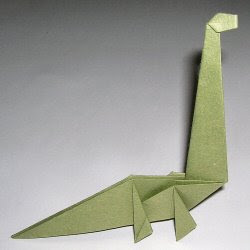 Even if you haven't seen a dinosaur so far, and have a chance to see kind of this work, maybe you won't think that a dinosaur is made from a origami paper. Because you know what the dinosaur is by TV, books, movies...etc...could be. A dinosaur is an ancient animal, and it is made with bones and blood and meat... etc (sorry, I don't know detail), so it's not a thing made from paper. 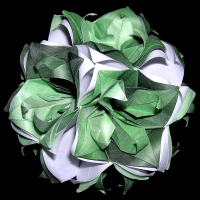 But if you see this work of photo, you may think a kusudama is made with (origami) papers. Because you don't know what kusudama is. Origami is technique to express form of something (for example, animal and plant and accessory...and so on) with papers. Kusudama origami is a thing which express an kusudama with origami papers. So, this is a point. 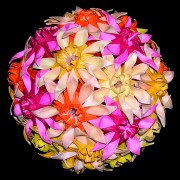 Kusudama is one of the ornament made with some harbs or flowers(iris, Japanese iris, Citrus tachibana...etc). Do you want these diagrams? The diagram is shown for my friends of myspace personally. There is in folder of my album. If you haven't been my friend, please feel free to ask me it. I hope you enjoy it!! Dear participants of the gamePlease send the email which demands it to obtain the diagram to me by April 14, 2008 if you have a right. This diagram isn't the permanent file. I'll present the diagram free of charge for persons who wrote the comment, if I(we) will not get the 50 comments. Thank you for requesting. please write in it at a comment column of this article. One person can vote only once. And the person who can vote for this is limited to the next person. 1. The person who has a web site of oneself. I'm writing another blog "origamio.com blog", too. © Mio Tsugawa All Rights Reserved.